Clyde Hill is a small city of 3,000 people in King County, Washington. It is located between the major cities of Kirkland and Bellevue, just across Lake Washington from Seattle. The city, which is self-described as "park-like", has a mandatory minimum 20,000 square foot lot policy on all new homes and is almost completely residential. 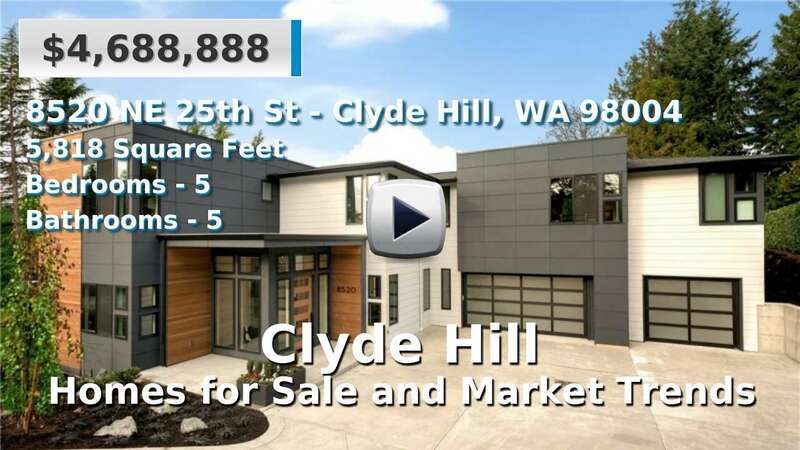 All homes for sale in Clyde Hill are luxury estates, typically custom built and either located on or have views of Lake Washington. Views of the Olympic, Cascade Mountains and Mount Rainier are also common. 4 Beds | 3.25 Baths | 4260 sq. Ft.
5 Beds | 3.25 Baths | 4290 sq. Ft.
5 Beds | 4.25 Baths | 5946 sq. Ft.
5 Beds | 6.75 Baths | 5540 sq. Ft.
4 Beds | 4 Baths | 4106 sq. Ft.
4 Beds | 2.5 Baths | 3020 sq. Ft.
4 Beds | 2.5 Baths | 4350 sq. Ft.
3 Beds | 3.5 Baths | 4600 sq. Ft.
3 Beds | 2.25 Baths | 3350 sq. Ft.
4 Beds | 3 Baths | 4200 sq. Ft.
4 Beds | 3 Baths | 3258 sq. Ft.
5 Beds | 3.25 Baths | 4692 sq. Ft.
4 Beds | 3 Baths | 5110 sq. Ft.
5 Beds | 2.75 Baths | 3020 sq. Ft.
5 Beds | 5 Baths | 7716 sq. Ft.
4 Beds | 5.25 Baths | 7620 sq. Ft.
4 Beds | 3.75 Baths | 5300 sq. Ft.
5 Beds | 5.75 Baths | 5358 sq. Ft.
4 Beds | 2516 sq. Ft.